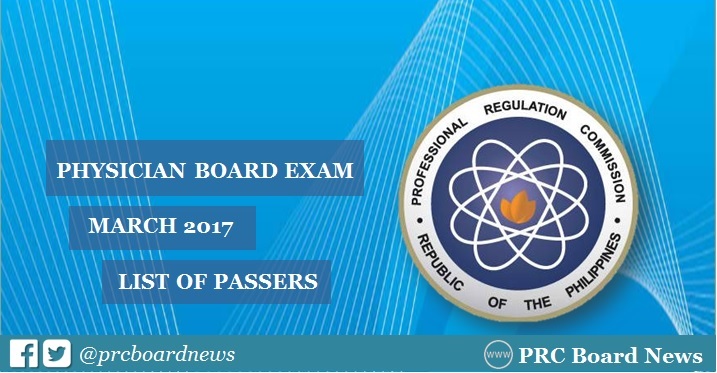 (Updated March 16) The Professional Regulation Commission (PRC) and the Board of Medicine released the official results of March 2017 Physician board exam in 3 working days after the exam. The complete list of passers, topnotchers (top 10), top performing schools and performance of schools are available on this page as announced online on Thursday, March 16. UPDATE: PRC announces that 813 out of 1,317 passed the Physician Licensure Examination. The physician licensure exam also known as medical board exam was conducted on March 5,6, 12 and 13 in the cities of Manila, Baguio, Cebu and Zamboanga. The four-day exam covered the following subjects: biochemistry, anatomy and histology, microbiology and parasitology (March 5); physiology, legal medicine, ethics and medical jurisprudence and pathology (March 6); pharmacology and therapeutics surgery and opthalmology, otolaryngology and rhinology and medicine (March 12); and obstetrics and gynecology, pediatrics and nutrition and preventive medicine and public health (March 13). According to PRC Resolution No. 2016-1019, the target release date of Physician board results is on Thursday, March 16, 2017 or in 3 working days after the exam. In the same period last year, PRC has released results after 2 working days. A total of 483 out of 1,044 passed the examinations. In September 2016, PRC has released results after 3 working days. 2,899 out of 3,695 successfully passed the exam. PRC named Far Eastern University-Nicanor Reyes Medical Foundation as the top performing school for March 2016 Physician Licensure Examination for having 80.53% (91 out of 113 passed the exam). In September 2016, Pamantasan ng Lungsod ng Maynila (PLM) and Saint Luke's College of Medicine topped the schools as they garnered 100% passing rate. Which school do you think will top March 2017 Physician board exam? PRC Board News will update this page immediately for the complete list of passers, topnotchers and performance of schools.